Lil' Lum G-10 Black - Spyderco, Inc. Page 984 – Spyderco, Inc. 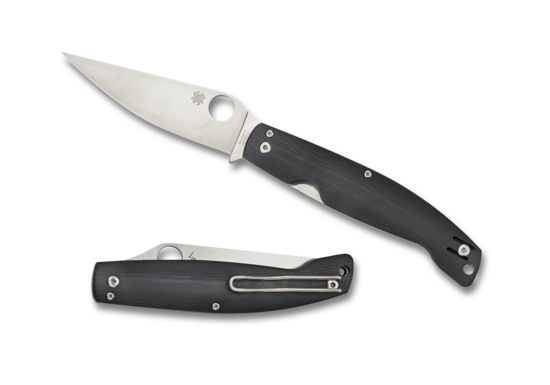 Inspired by the timeless work of the late custom knifemaker Bob Lum, Spyderco’s Lil’ Lum translates one of his most popular and enduring ethnic designs into an extremely compact folding knife optimized for everyday carry. Like Spyderco’s classic medium and large-sized Lum Chinese patterns, the Lil’ Lum traces its history back to a generations-old traditional Chinese folding knife called a “Shilin Cutter.” And like all of the members of our elite Ethnic Series of knives, it translates the classic cultural style of the original into a modern, state-of-the-art cutting tool. The Lil’ Lum’s iconic “bamboo-leaf-shaped” blade is crafted from VG-10 stainless steel and features a full-flat grind and a full-bellied PlainEdge™ cutting edge for exceptional edge geometry and low-friction cutting performance. The blade’s Trademark Round Hole™ provides a purchase for swift, one-handed opening and a sturdy LinerLock mechanism in the handle locks the blade securely in the open position. The handle’s full skeletonized stainless steel liners and open-backed construction ensure superior strength while minimizing the knife’s overall weight. Textured black G-10 scales ensure a positive, non-slip grip and a reversible pocket clip configured for right or left-side tip-up carry guarantees immediate access. Straddling the line between tradition and reliable high performance, the Lil’ Lum is a truly unique cutting tool with deep ethnic roots.